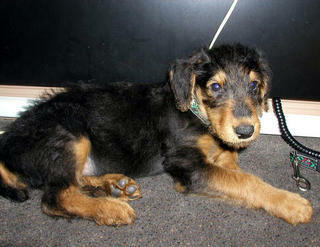 Bogart Handsome Devil began life as the 2nd strongest pup in a litter of 15 in rural Virginia. He was somehow able to telepathically contact his “real” mom, Lulu, in the few weeks after he was born. A grainy photo sent to her by his breeder cemented the relationship, and this blog was born. After traveling cross country for the first time via airplane, Bogart first set paw down on the streets of Los Angeles. And he liked it well enough to almost immediately fall asleep. He has lived, loved, and lost his way through Los Angeles, CA, Portland, Oregon, across the country to Philadelphia, and now in Pittsburgh. Bogart’s full AKC name really is Bogart Handsome Devil. The Bogart was directly inspired by Humphrey Bogart, a class act and “real man”. The Handsome Devil, well that was the easy part. One look at his fuzzy little mug and it was set. Bogart’s love for cats cannot be underestimated. His feline housemates Felix and Boris – the “midnight men” – saw (and see) to it that they have a bit of fun at his expense as well as train him to do their bidding. Bogart is indeed a Renaissance Man – skilled in the arts of subtle inter-dog negotiations, manipulation of pet store employees for the procurement of free treats, and the gentle dominance of his hapless humans – he rules his kingdom with a fuzzy fist.